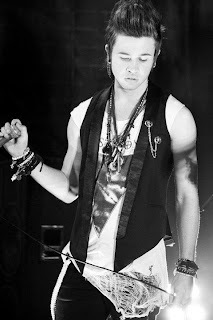 SnapCacklePop: SnapCacklePop Interview - Reece Mastin..! SnapCacklePop Interview - Reece Mastin..! On the promotional trail for his new song Shut Up And Kiss Me we recently caught up with last years X-Factor winner Reece Mastin at Sony's Studios in Sydney. It was great meeting Reece where we discussed his new video and upcoming album, his fresh tatts, working with Benji Madden of Good Charlotte, his secret pop crush, who he's taking to his prom & more! Check out our interview below..! Two of our lucky readers Danielle & Chloe have scored signed copies of Reece's new single Shut Up And Kiss Me and we have 3 more copies up for grabs for Reece's fans - simply tell us 'what Good Night you'd have with Reece to make him say Shut Up And Kiss Me to you'! We'll pick the 3 best and most creative entries and they'll score a personally signed copy of Shut Up And Kiss Me! Exciting!! Just email us your name and answer and let us know what Good Night you would have planned for Reece. Competition closes Friday 27th April 2012.